Pro Hart 1928-2006. Kevin "Pro" Hart was born in Broken Hill, NSW, Australia in 1928. He grew up on the family sheep station "Larloona" situated near Broken Hill, and he was educated by correspondence with this brother Bob, and their Mother as tutor. In his early twenties Pro moved to Broken Hill and worked underground as a miner. In 1960 he married Raylee June Tonkin and they had five children, three boys and two girls. From age seven, Pro loved to sketch and paint. He began taking his gift seriously in his early twenties when he first used painting as a creative outlet to keep him sane from underground life as a miner. To develop his gift, Pro attended a few local art classes but is mainly self-taught. He was discovered in 1962 by a gallery director in Adelaide. From there his success as an artist began to flourish. Mainly working in oils and acrylics, Pro will use any tool or method to achieve the desired outcome for his work. He draws upon techniques of layering, chiaroscuro, glazing, scumbling, scratching and Alla prima. Pro is also a sculptor working with welded steel, bronze and ceramics. His private complex, including a three-storey gallery in Broken Hill, houses one of the largest private collections in the Southern Hemisphere, featuring both Australian and European Masters. His work has been exhibited all over the world, in Australia, London, Dusseldorf, Los Angeles, New York, Hong Kong, Tokyo, Singapore, Israel, Cairo and Manila, in the finest of galleries and venues, with many of his exhibitions being sell-outs. 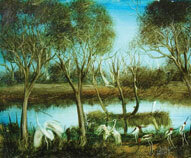 His paintings are represented in collections owned by the likes of Harold Mertz, Lyndon Johnson, Prince Phillip, Qantas Airways, Margaret Carnegie, the Canberra War Memorial, the University of NSW and Adelaide, the Bonython Collection, the Warsaw National Collection of Poland and Cathay Pacific Airways. Pro Hart is the only artist in the world to mark his original artwork with DNA. All Pro Hart artwork sold through House of Phillips is protected by a unique product protection system (DNA ArtGuard) incorporating DNA codes from Pro Hart. These unique codes have been incorporated into a DNA Artmark that is applied to the artwork in conjunction with digitally imaged details stored in a database. The DNA Artmark is detectable by electronic means as proof of the artwork's authentication. Pro has many achievements to add to his successes. 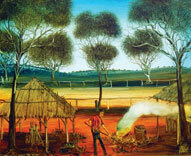 In 1976 he was awarded an MBE for his services to art in Australia. In 1982 he received an Honorary Life Membership of Society International Artistique for outstanding artistic achievement. This is granted to only one artist per continent and in 1983 he received an Australian Citizen of the Year Award. Outside of painting, Pro has many interests. He loves to collect vintage cars including Fords, Chevrolets, Bentleys, Rolls Royces and a variety of motorbikes. He lifts weights to keep fit, is an "A" grade pistol shooter, and loves inventing different kinds of engines and machines. Music forms an important part of his life, he owns a Rodgers Electric Pipe organ, the largest of its kind in Australia, which he loves to play when he finds a spare moment in his full life. Pro Hart, passed away peacefully in his home town of Broken Hill at 2:34am on Tuesday, 28 March 2006 at the age of 77. He was comforted by his wife of over 40 years, Raylee and their 5 children - John, Kym, Marie, Julie and David. Pro was diagnosed in December 2005 with Motor Neurone Disease which is a progressive fatal condition that causes muscle wastage. A truly remarkable Australian who will be remembered both for his contribution to the Australian art scene and to the community.